Written by Zach A. Pictures by Aj L., Bob C., and Matt K.
I arrived at Six Flags New England at 5 AM for the early morning portion of media day. Huge thanks to Rus, regional rep for the American Coaster Enthusiasts New England Region, for giving me the opportunity. 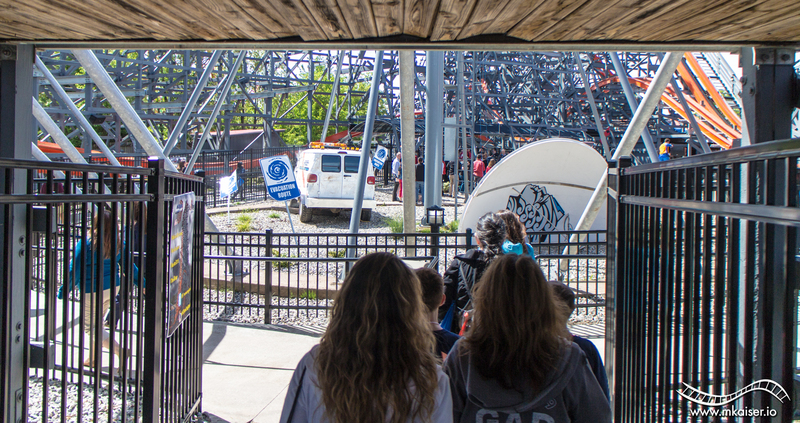 We were escorted to Wicked Cyclone through the maintenance area. I’ve never done anything like that before, so it was incredibly cool. While we were walking up to the coaster, it started testing. This was my first time seeing a Rocky Mountain Construction roller coaster run in person. I was definitely amazed. 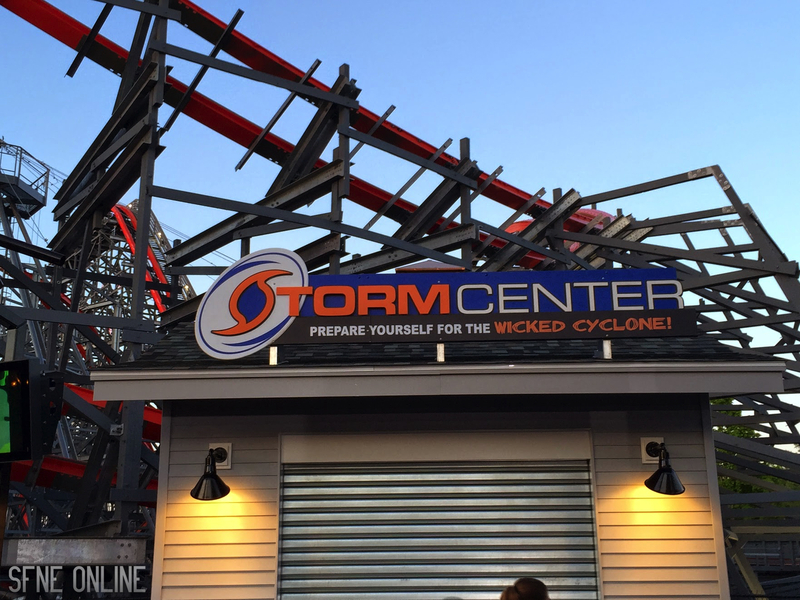 The signage and overall look of Storm Center is very nice. Later on in the day, the store opened. I was pleasantly surprised at how big it is. My only issue is how limited the T-shirt selection is. 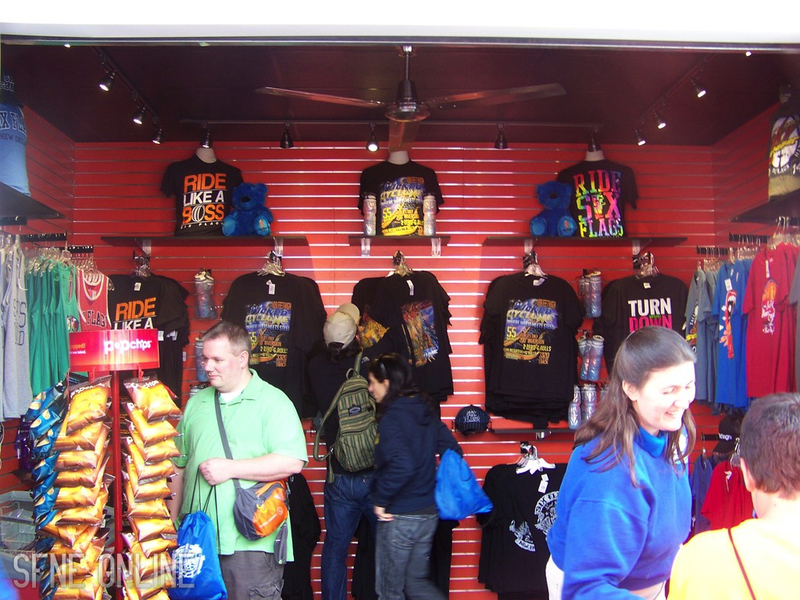 Personally, I don’t like my coaster shirts to have the stats on them. There’s one stat shirt and then another without the stats, but it has way too much going on in it. I like mine nice and simple, so I purchased one that just had the logo on it (not shown in the picture below). The first thing guests will see when entering the queue is the C.H.A.S.E. storm chasing van and a crashed satellite dish. The lights on the top flash while fog comes out of it. The attention to detail is awesome, especially for a Six Flags park. After passing the C.H.A.S.E. van, the queue goes under the 200-degree stall. On the lift motor building is this plaque. These pieces of old Cyclone wood were signed by members of the American Coaster Enthusiasts at the annual Great Nor’Easter event. 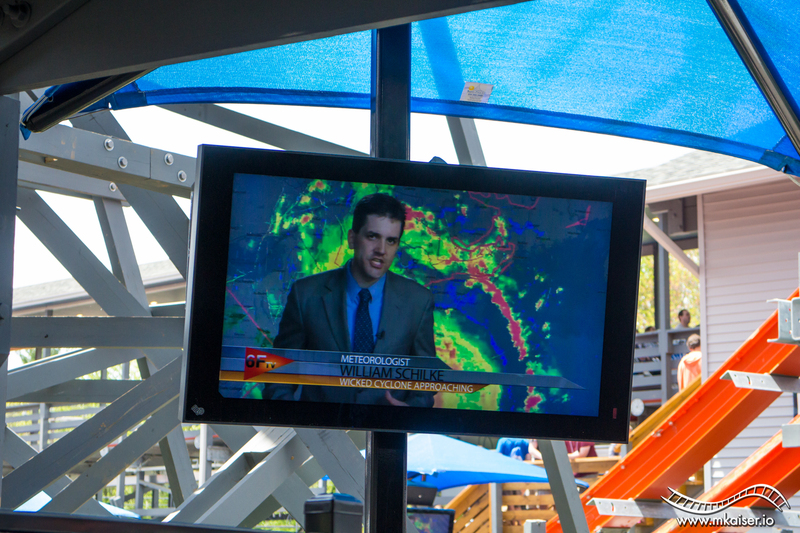 Also in this area is our first look at something that makes the theming of Wicked Cyclone even better. 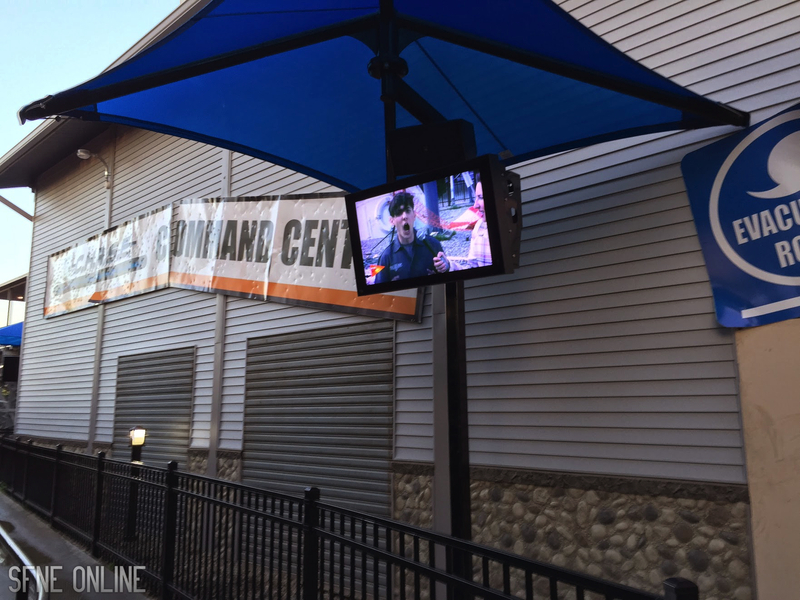 The park filmed these entertaining videos that tie the theming together. They’re basically like a pre-show, except there’s no bottlenecking of the line to make guests watch them. The videos are also full of easter eggs. After this is the crashed C.H.A.S.E. plane. Again, this has fog coming out of it. 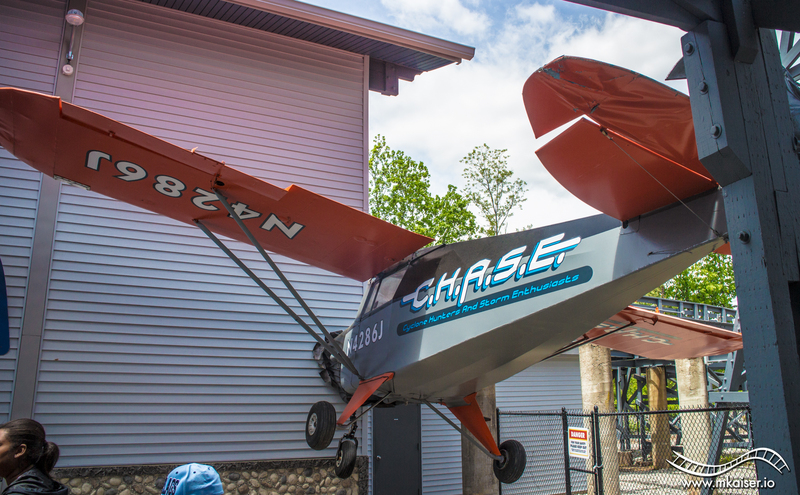 The plane actually crashed right into the C.H.A.S.E. Command Center! 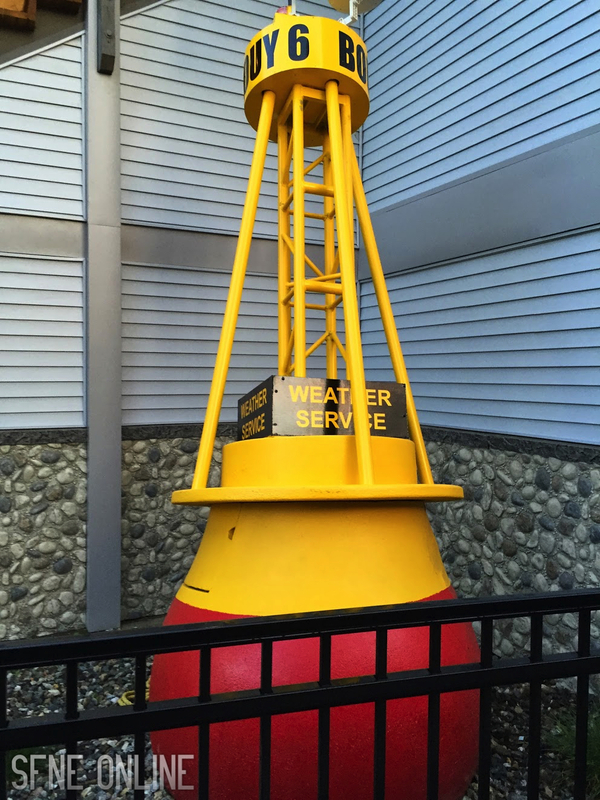 A random buoy landed here after a storm. Then right before the stairs into the C.H.A.S.E. Command Center is a boat. This too has flashing lights and fog. Here’s a nice look at the station. All of the walls are covered in newspaper clippings documenting the storm that was mentioned in the queue videos. The station received a new floor along with some really cool-looking ceiling fans. Also notice the TVs on the wall. Instead of having a random voice recording with the safety instructions, the park opted to do a themed video making those announcements. Very cool. Also, notice what the employee is wearing. 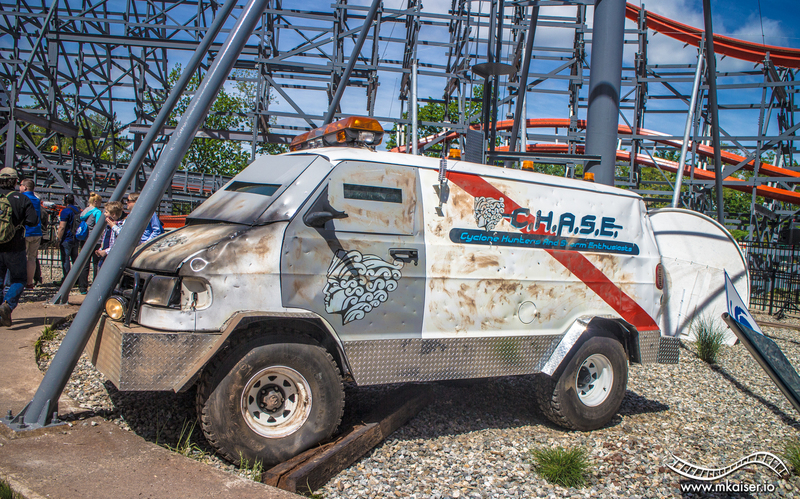 All of the Wicked Cyclone ride operators have a special C.H.A.S.E. themed ride uniform. 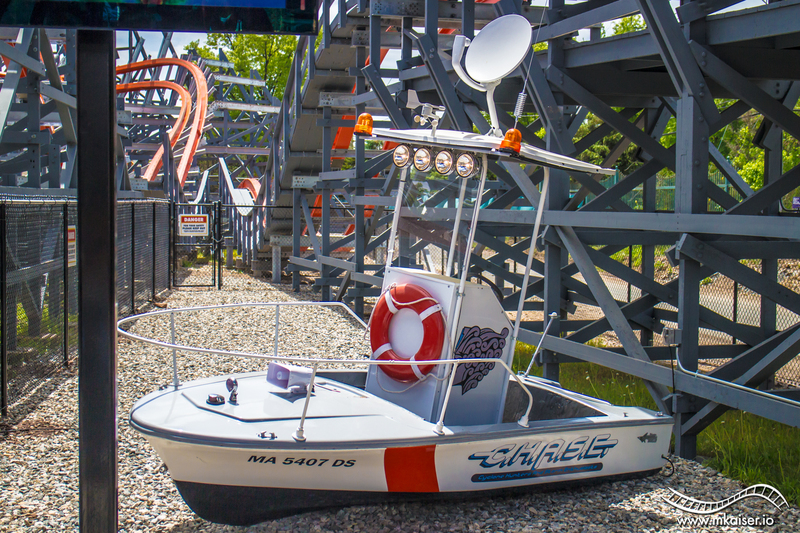 This is a completely new concept to Six Flags New England. They will continue wearing these outfits until at least the end of the year. No idea if they will wear them next year. After exiting the ride, there is a photo booth. Unfortunately it didn’t open during media day. Now that we’ve covered the update portion of the post, let’s jump into the review. 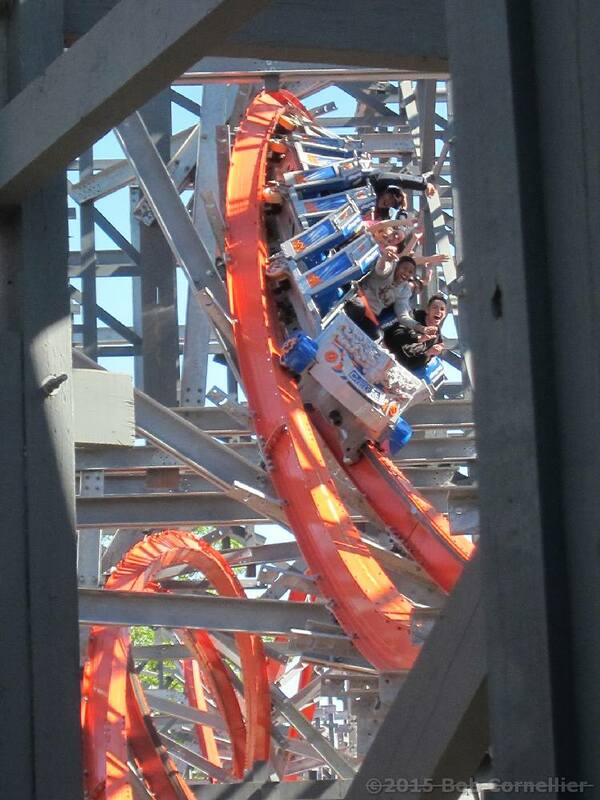 Wicked Cyclone was my first Rocky Mountain Construction roller coaster. Therefore, I didn’t really know what to expect going into my first ride. All I had to go by was what other people have said about RMC coasters and the POV video Six Flags New England released. By the end of media day, I was able to ride Wicked Cyclone ten times. Several of those rides were in the front and back, with the rest being somewhere in the middle. My review is based off all of these rides together. 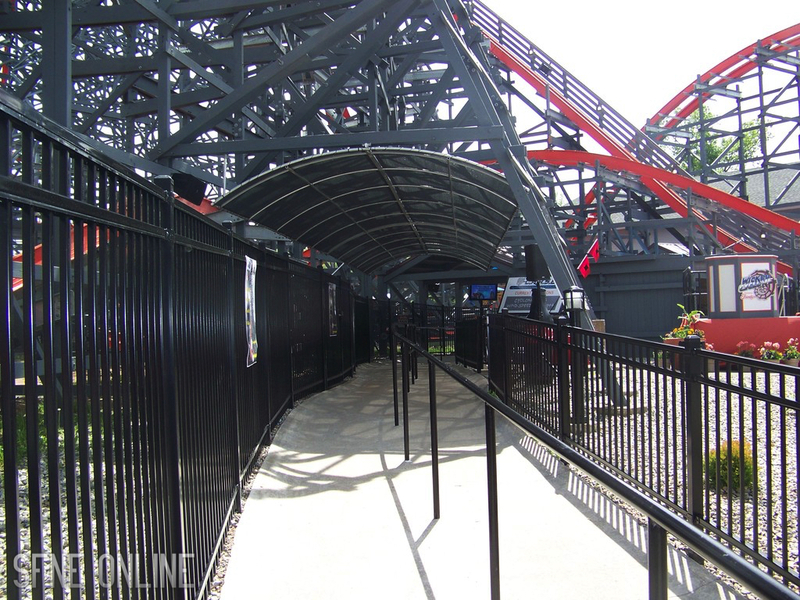 After the turn out of the station is the 45° lift hill. Let me just say, this is a lot steeper than it looks. Since the lift hill is so steep, the climb up is extremely quick. 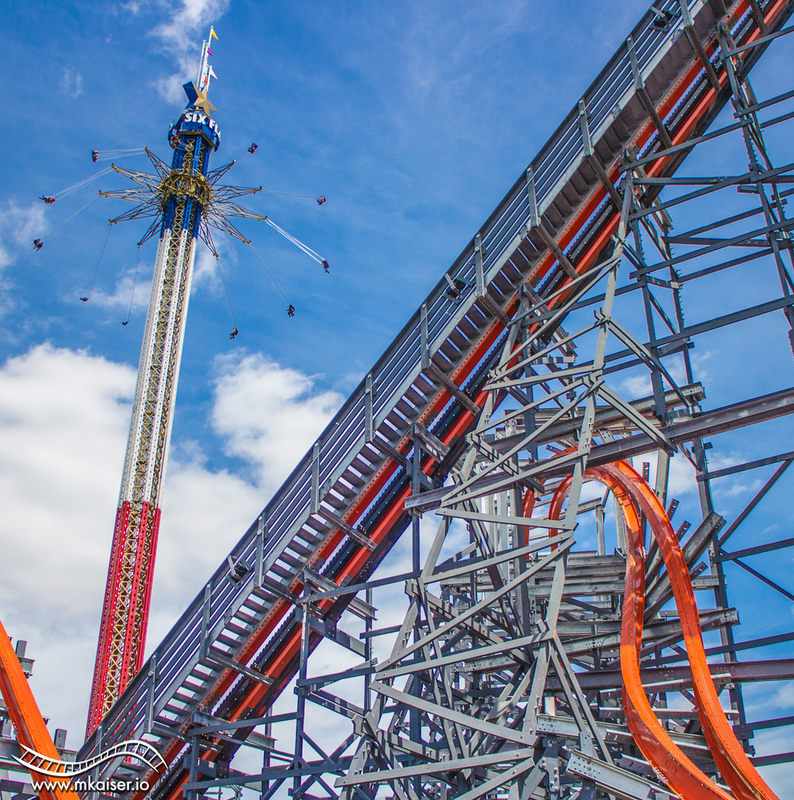 Then there’s the 78° first drop. There’s no turning back after that, as once the train disengages the lift hill, it’s a relentless ride back into the station. 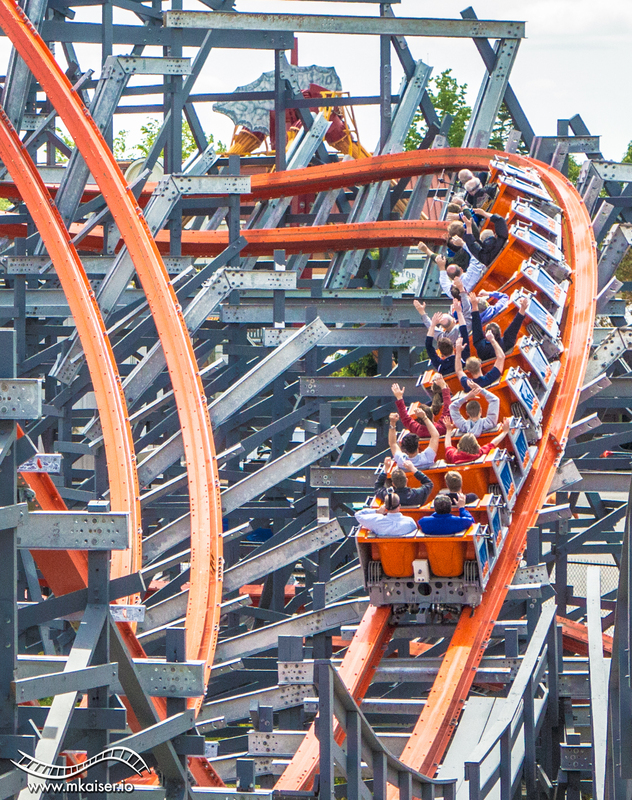 The airtime on the first drop is even better than the airtime that riders get on Bizarro, especially if sitting in the back row. 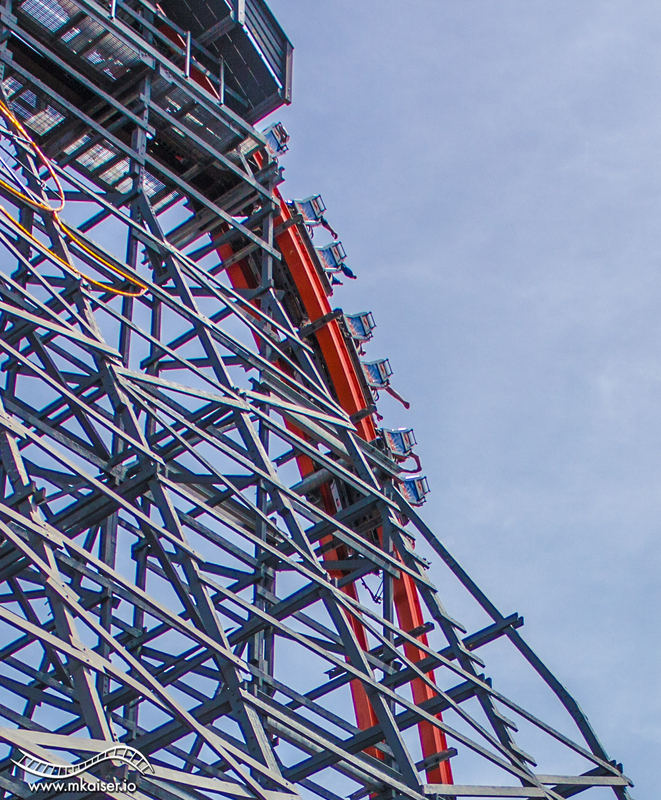 The way the top of the lift is shaped makes the back half of the train whip over it, providing intense ejector airtime. 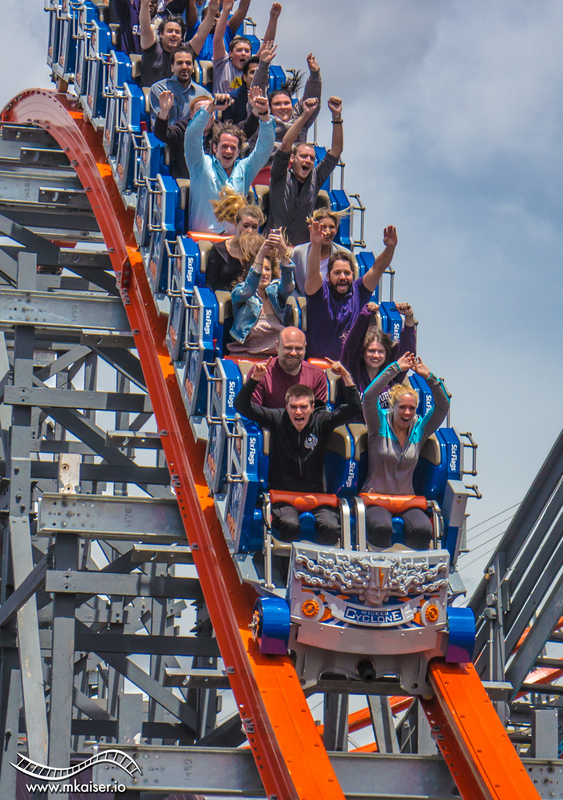 Immediately after being thrown out of the seat, there are intense positive-G’s at the bottom of the drop. These forces can be found on any seat of the train. From the first drop, riders chase the storm through the 120° over banked turn. I do have to say, this isn’t as thrilling as I thought it would be. 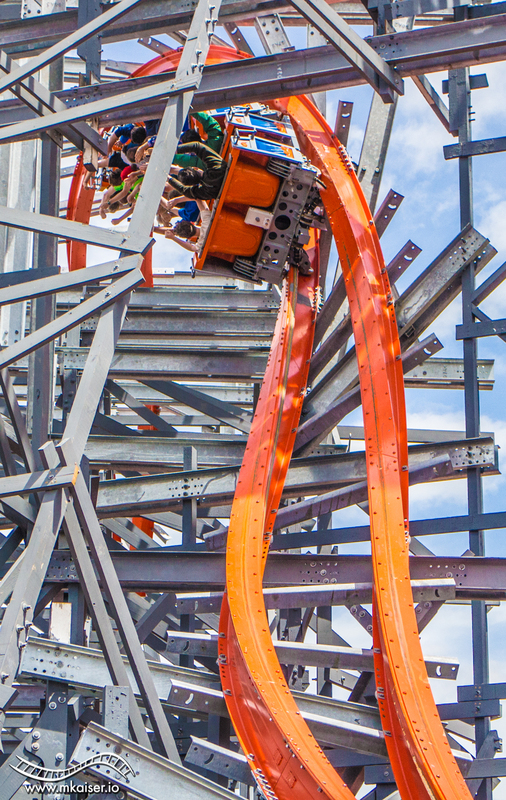 The over banked turn on Bizarro is much more thrilling and forceful. 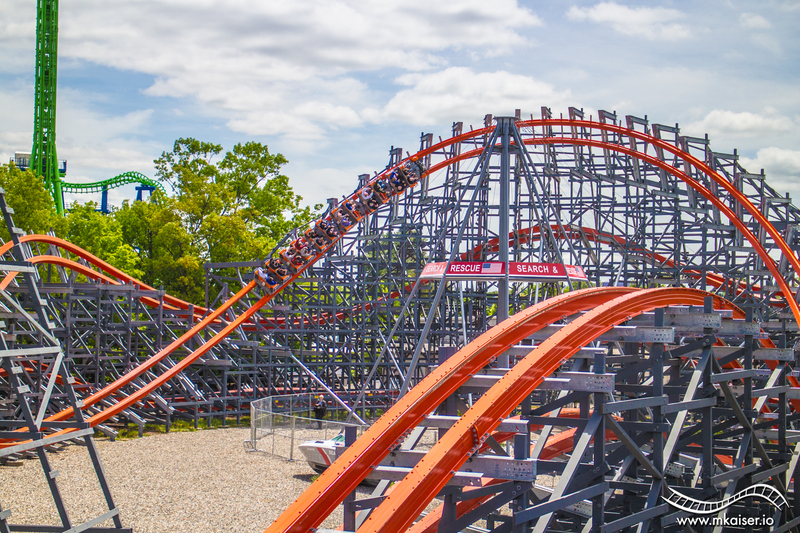 I’m not saying the one on Wicked Cyclone is forceless or anything, it’s just not as good as the one on Bizarro. After that there is a small bunny hop which banks slightly outwards. 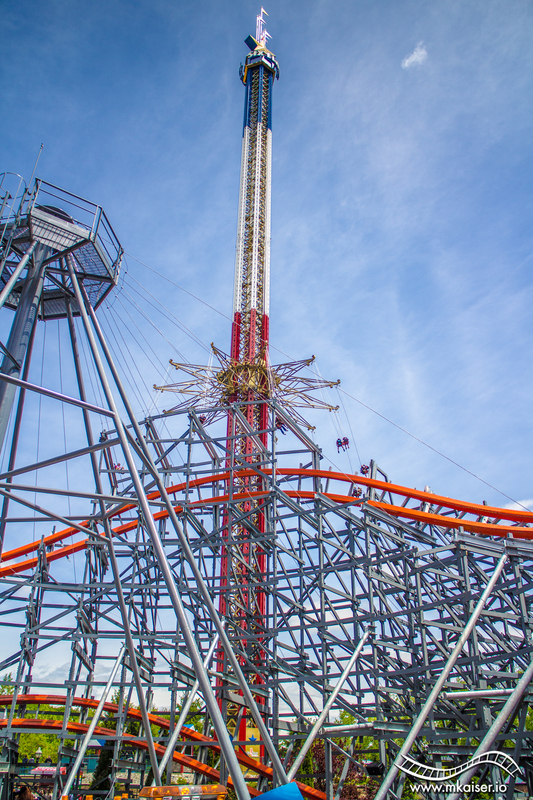 This is the first time riders will be able to feel the intensity of RMC’s airtime. I was expecting floater airtime in this section since the hill is drawn out a bit. Boy was I wrong. To make things even more thrilling, as soon as you’re sitting back in the seat, you get whipped into the 200° degree stall. I’ve never been on a coaster that inverts that only has lap bars. I know there are a lot of coasters out there that do this, so I can’t say I was worried about it, but it was a bit intimidating. In fact, I actually liked feeling intimidated. I haven’t felt that way about a coaster since I first started riding. The experience of just hanging there with nothing over your shoulders is a glorious feeling. The slight twist that turns this into a 200° degree stall makes it that much more insane. Like I previously mentioned, after the 200° degree stall is a second over banked turn. Immediately following that is the double down. The little dip between the top of the double down and the over banked turn surprisingly has a lot of positive g-forces. Based off of other reviews of RMC’s coasters, I gathered that RMC coasters are mostly full of negative g’s. I didn’t find this to be the case with Wicked Cyclone. I’ll need to ride another RMC coaster for comparison. Side note: People have been expressing their disappointment that the first over banked turn didn’t have the head choppers that were shown in the animation. I barely noticed them on the second over banked turn, so I imagine it would have been the same on the first one. Then there’s the double down. Crazy ejector airtime on both of these hill. In fact, from this point on, my shirt would not stay down. I was out of my seat so much that my shirt kept flying up. I’ve never had that experience on any other coaster before. Haha. At first I thought it was just the type of shirt I was wearing, then when I asked someone else, they said the same thing had been happening to them too. 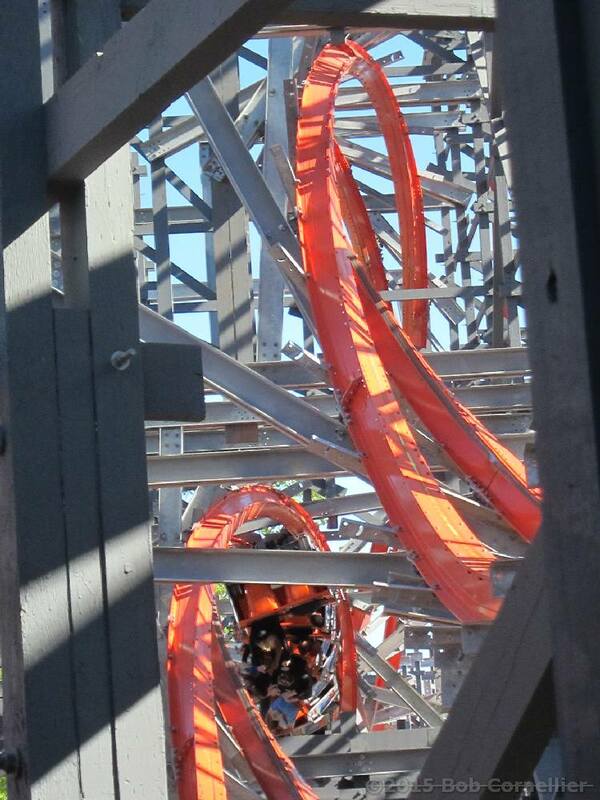 The double down leads into another crazy ejector airtime hill. This is one of two hills that have sustained ejector airtime, similar to what one might find on Bizarro. 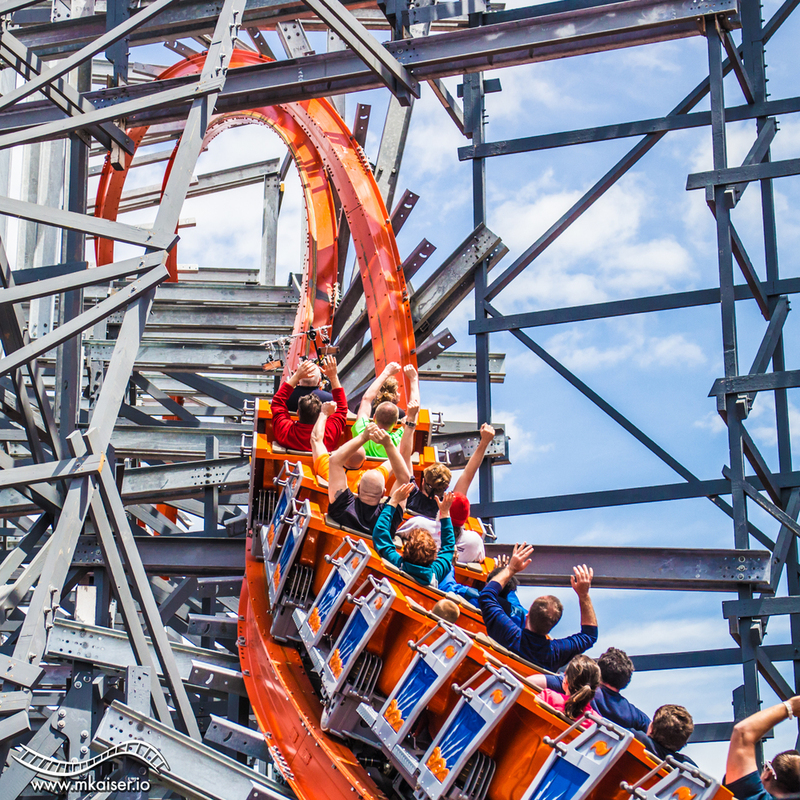 As if the first half of Wicked Cyclone wasn’t crazy enough, the ride becomes even crazier. 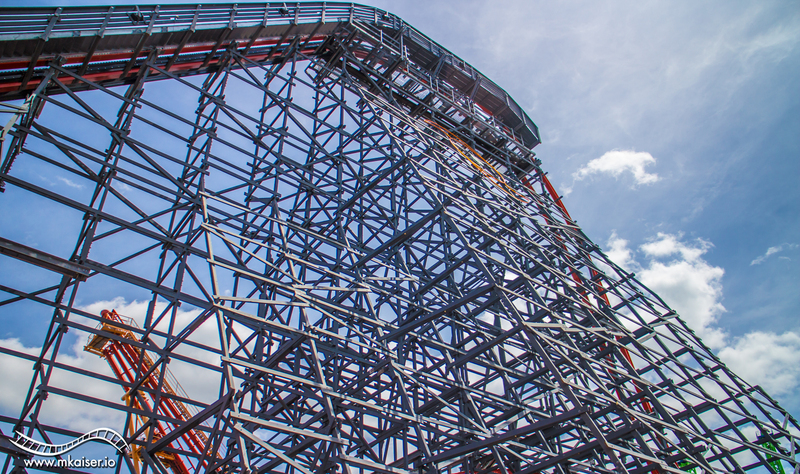 It starts hauling after the airtime hump that follows the double down. 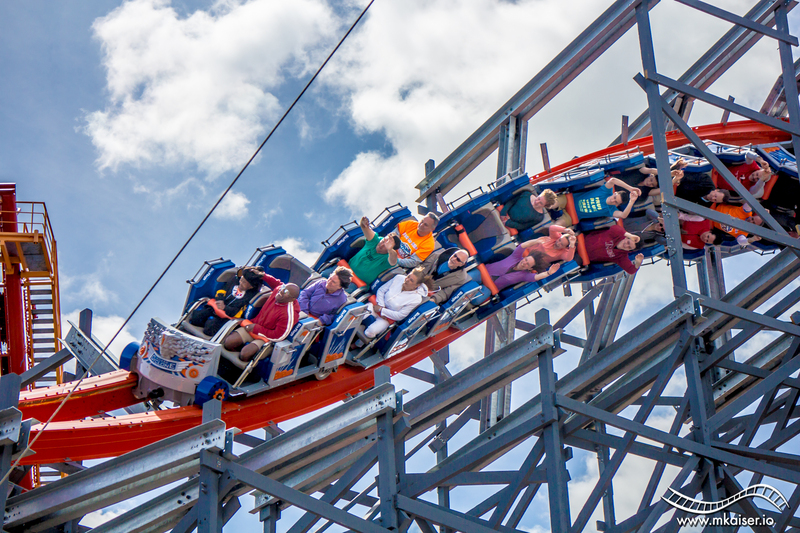 The train is thrown into a banked turn which immediately throws the train into the first of two outward banked airtime hills. 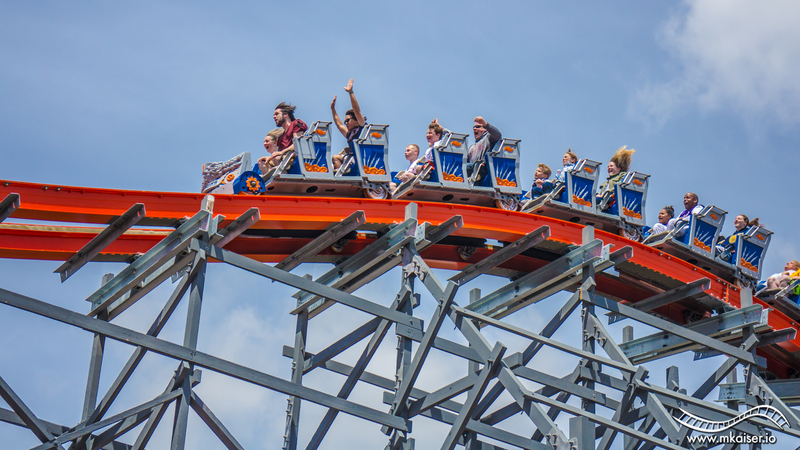 Originally, the ride was designed with only one outward banked airtime hill. 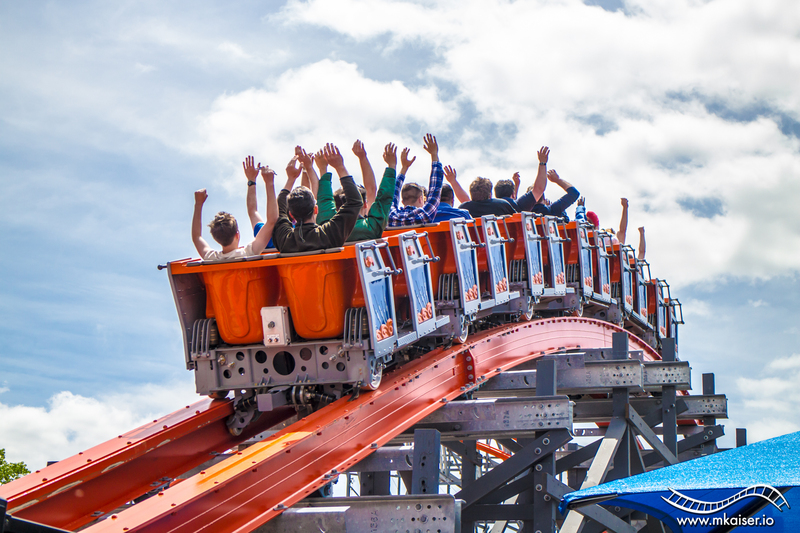 Somewhere between the announcement and when the track for this portion of the coaster started to arrive, the genius that is Alan Schilke decided to make Wicked Cyclone even better. This outward banked airtime hill provides some of the most intense airtime I’ve ever felt, especially when sitting on the left side of the train. I noticed that on all of my rides on the right side, the outward banked turns weren’t as intense. 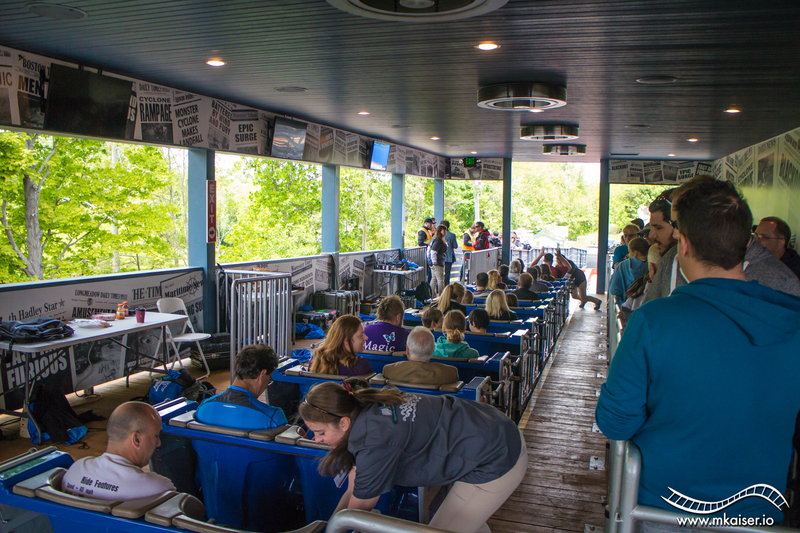 I’m just going to say it now, if you want the ultimate Wicked Cyclone experience, try to sit in the back on the left side. You won’t be disappointed. After going through another banked turn, the train is rocketed into the first zero-g roll. The hang time in this inversion is unlike anything I’ve ever felt before. 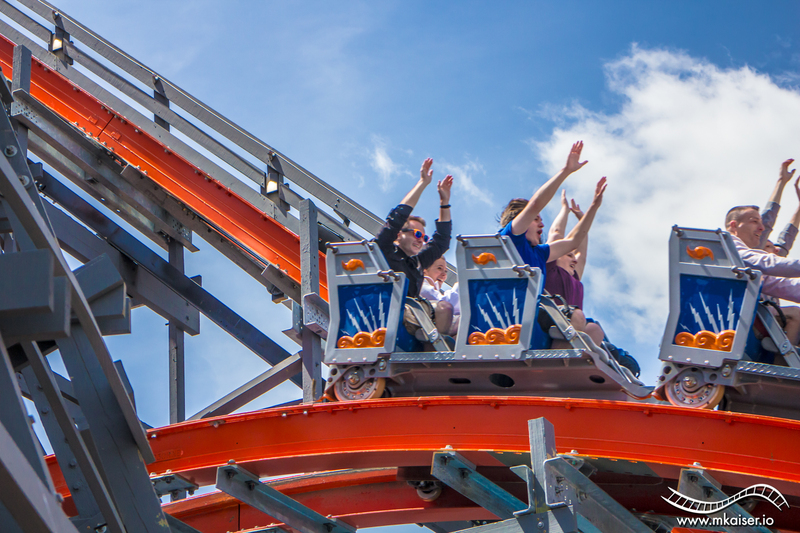 When in the zero-g roll, the train slows down a little bit before speeding up and catapulting riders into the second airtime hill with sustained ejector airtime. I think this airtime hill after the first zero-g will be a big surprise for many first time riders. It comes out of seemingly nowhere. 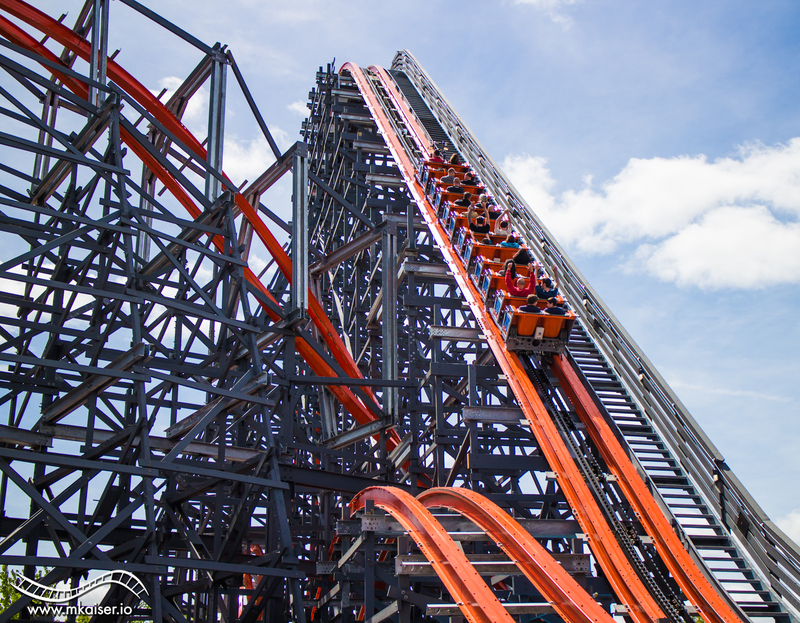 I’ve heard people comparing it to the airtime hill on El Toro that crosses (or crossed) over Rolling Thunder. That’s a pretty big statement. After this airtime hill is the “Driver’s Ed” turn as Alan Schilke likes to call it. It’s a series of three banked turns. This is the only spot on the ride that you can really catch your breathe. But you can’t catch your breathe for long… The other world’s first element (in addition to the 200° degree stall) is the Double Reverse Bank Airtime Hill. If you thought this looked crazy in the animation, you’ll be happy to know that it is even crazier in person. I’m not going to go any further with describing the DRBAH (I’m going to abbreviate the name from now on), as it’s something you just need to experience yourself. The only thing I’m going to add is that the on-ride camera is right after the DRBAH and it’s going to provide some hilarious on-ride photos. 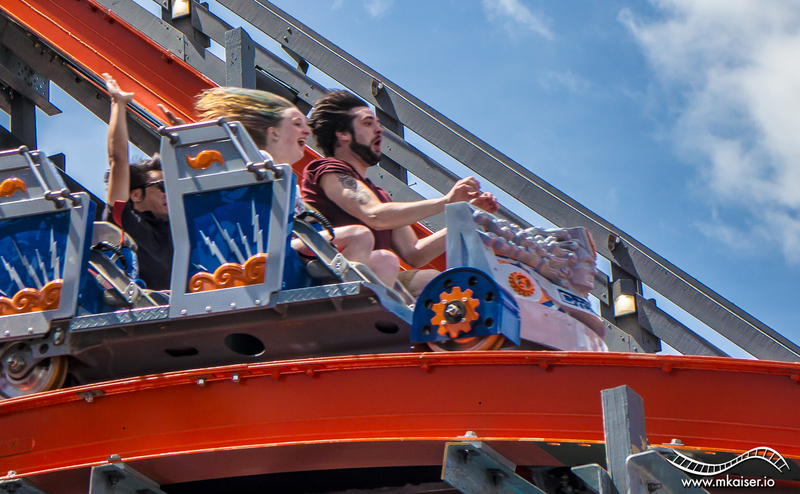 I know for a fact that I’m going to buy a photo each time I ride Wicked Cyclone with someone new, just to capture they’re reactions on camera. The final inversion/second zero-g roll is actually my favorite part of the coaster. It’s similar to the first zero-g, in that it slows down a bit when you’re upside down, except this is even crazier. Not only are there head choppers from the structure, but the ground is only a few feet away from rider’s heads. Once it snaps out of the final inversion, there are a bunch of small airtime hills that throw you out of your seat. The second outward banked turn (and the only one in the animation) was actually sort of slower than I anticipated. I felt like it was more floater airtime than ejector. 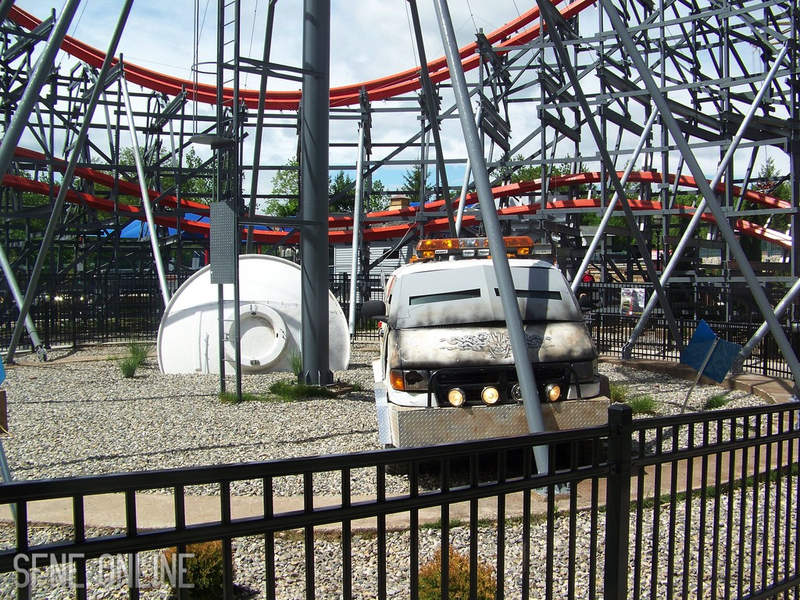 That’s fine though because the rest of the ride is ejector. The final two pops of airtime are also ejector, especially the hill that leads into the brakes! 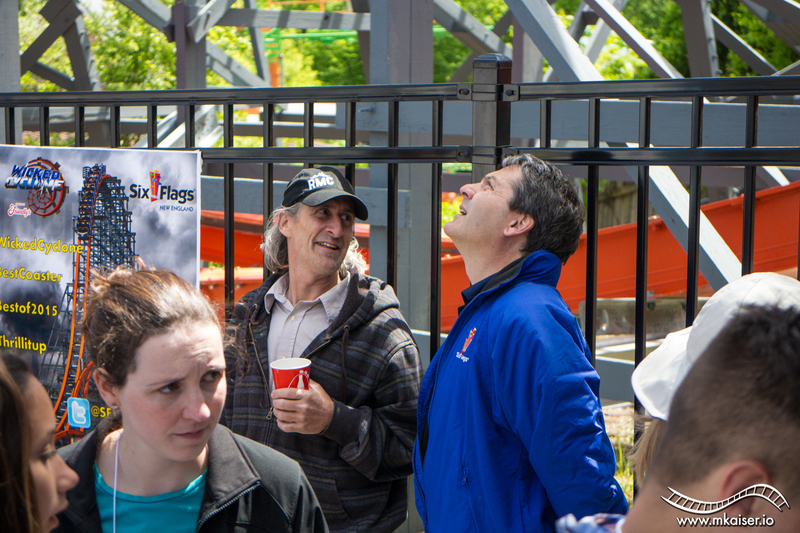 Alan Schilke and Six Flags Corporate Engineer, Larry Chickola. 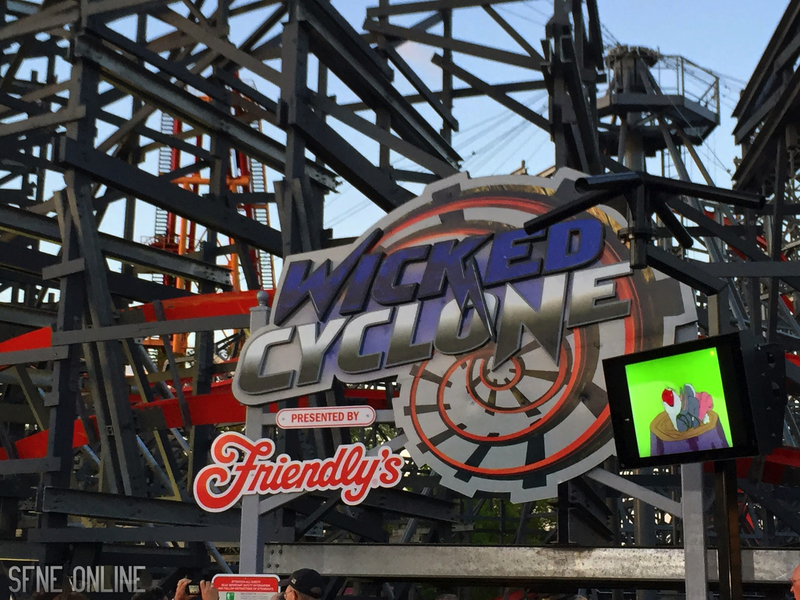 We had the chance to speak with Alan Schilke, the designer of Wicked Cyclone during the media event. 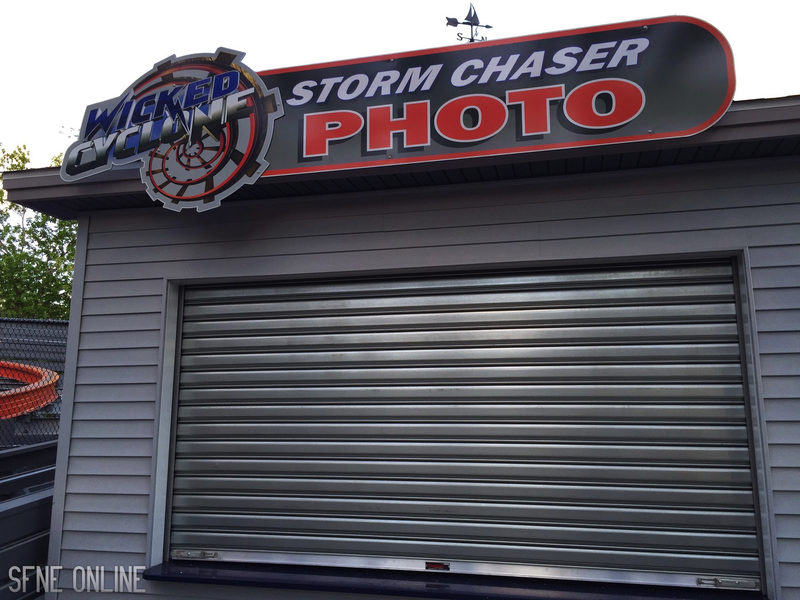 He let us know that Wicked Cyclone still has some breaking in to do. Currently the train is running a combination of nylon, steel, and urethane wheels to assist the breaking in process. The steel wheels will help rip the paint off of the track, as he told us that the orange paint has been sticking to the wheels, which was slowing the train down. 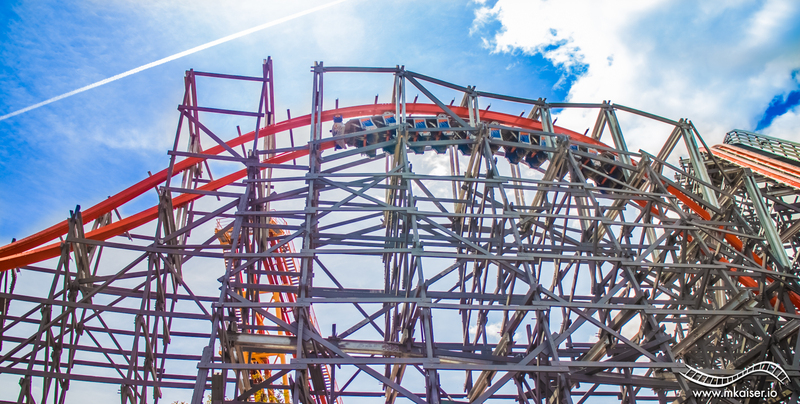 Once it’s fully broken in, Wicked Cyclone will be going even faster than it’s currently running. Honestly, I can’t imagine it going any faster that it has been, so I’m looking forward to riding it in a month or so. 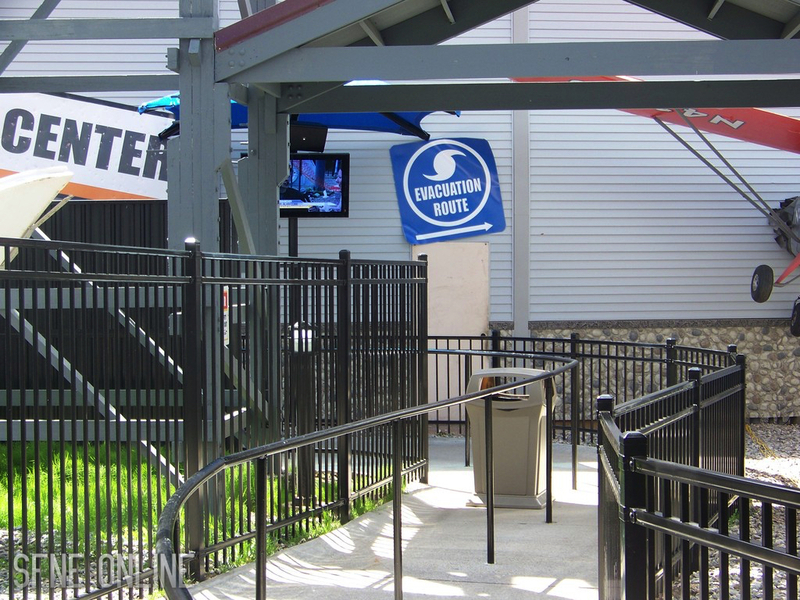 John Winkler, Six Flags New England’s Park President, mentioned that there is still a little bit theming left to add. This is very good news, yet unsurprising as SFNE has a trend of continuously adding extra theme elements to their attractions months after they open. 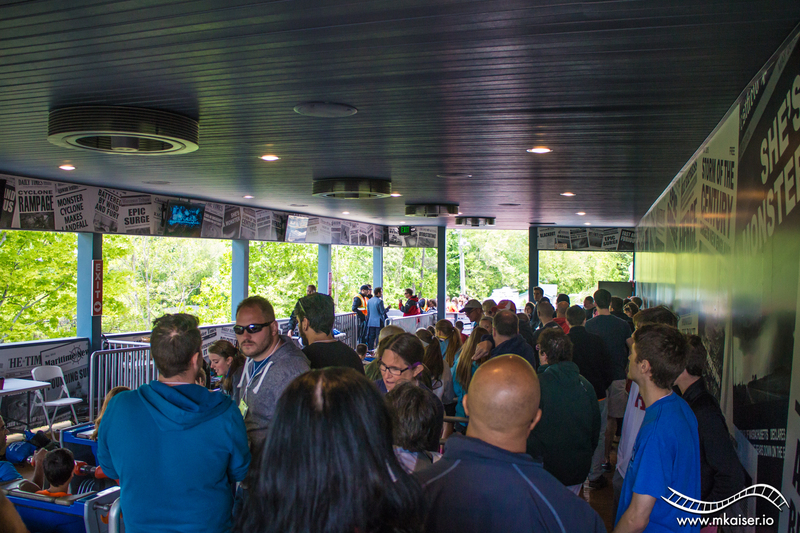 While the queue and station on Wicked Cyclone are nicely themed, it’s a bit lacking everywhere else. There’s one tiny boat near the first drop and other than that, nothing. It would be cool if they added some theming that acts as a head chopper. I would also freak out if they decided to add a vehicle with a fire cannon next to the mini hill after the first over banked turn. 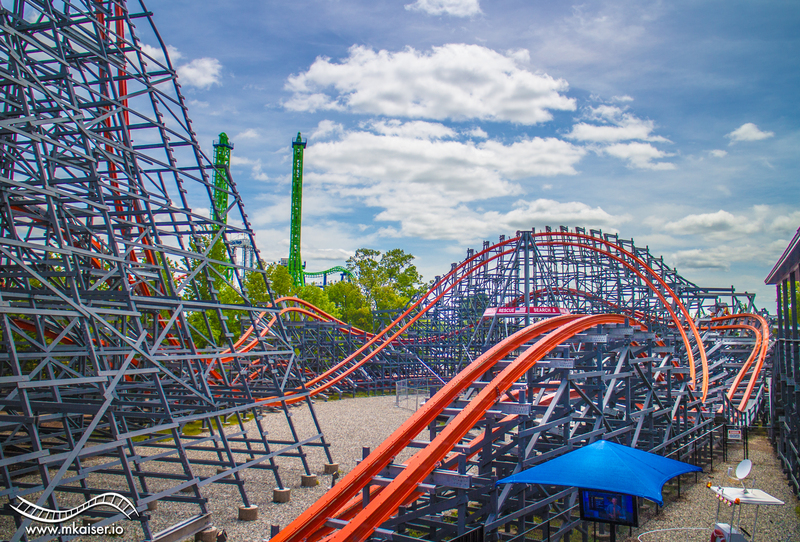 There’s no doubt in my mind that Wicked Cyclone will enter the top 5 list of many coaster enthusiasts. 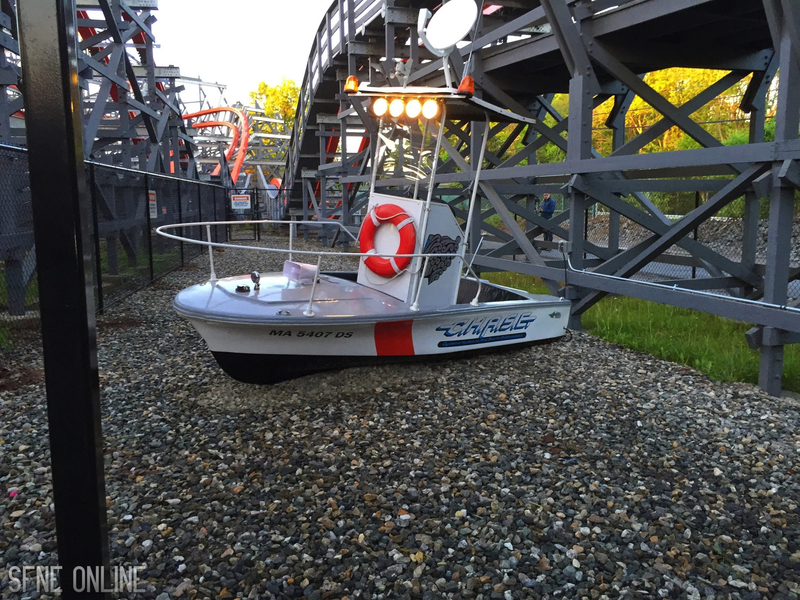 Six Flags New England definitely has a huge success. 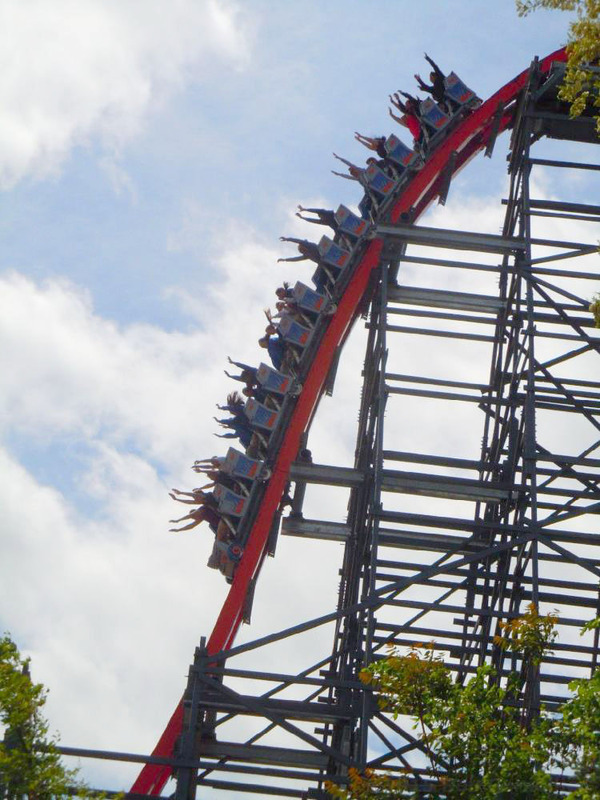 The coaster has the perfect amount of everything; from the hang time, to the airtime, the lateral and positive forces, and the inversions. 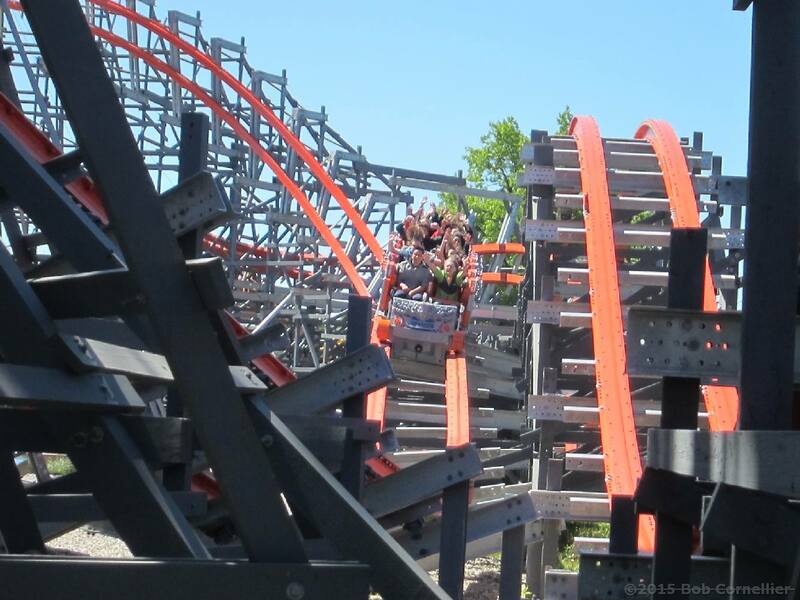 Wicked Cyclone has it all! 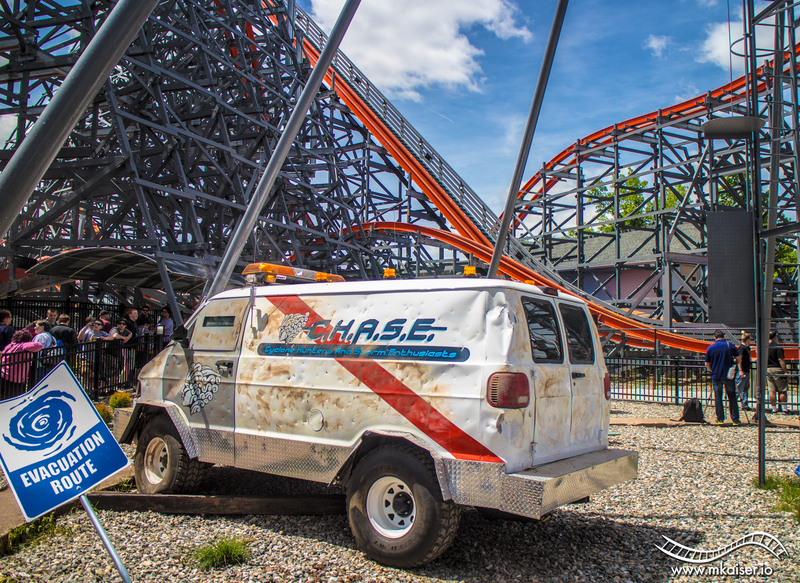 If you’re thinking about planning a trip to SFNE this summer, stop thinking and just book it. 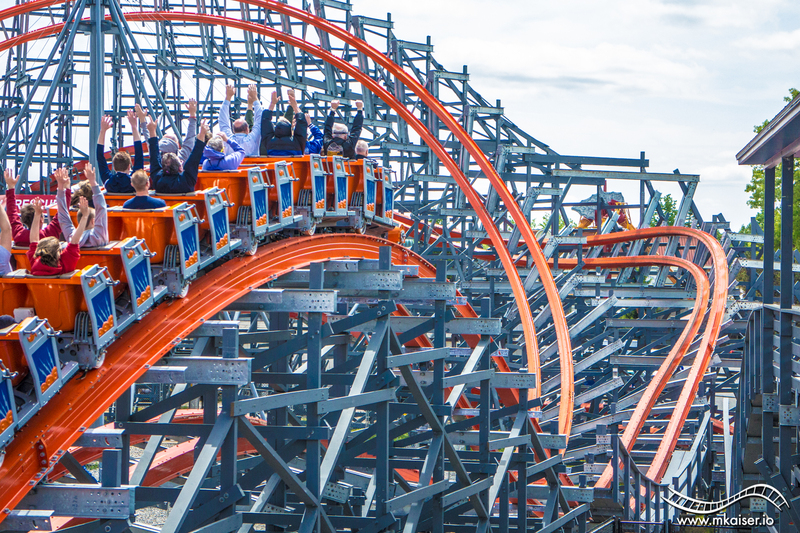 You will not be disappointed by Wicked Cyclone. I want thank the park for putting on another spectacular media event. 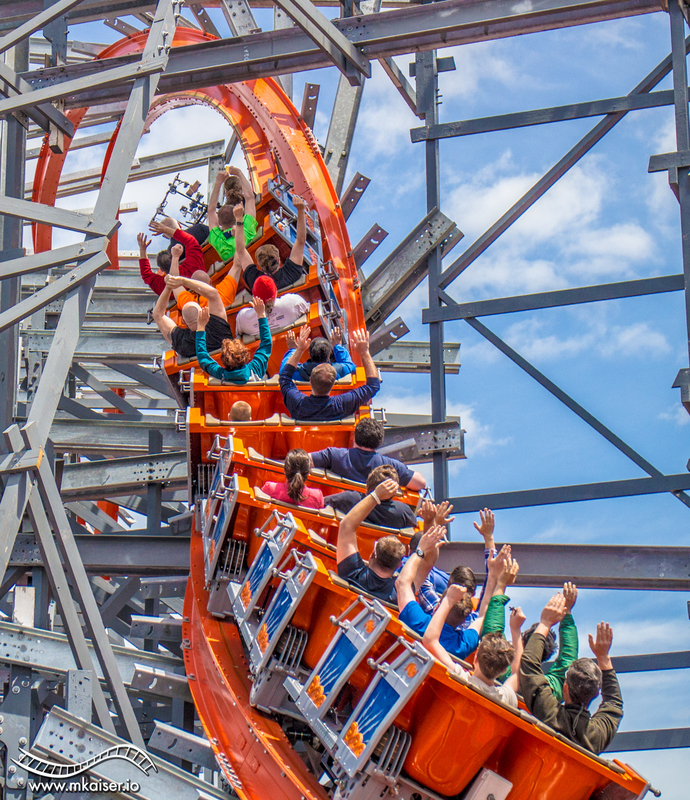 Huge thanks go out to Jennifer Mance, Jennifer McGrath, John Winkler, Kyle Croegaert, Pete Carmichael and everyone else at Six Flags New England for making this day special. I also want to thank Rocky Mountain Construction and Alan Schilke for bringing us this amazing new coaster. 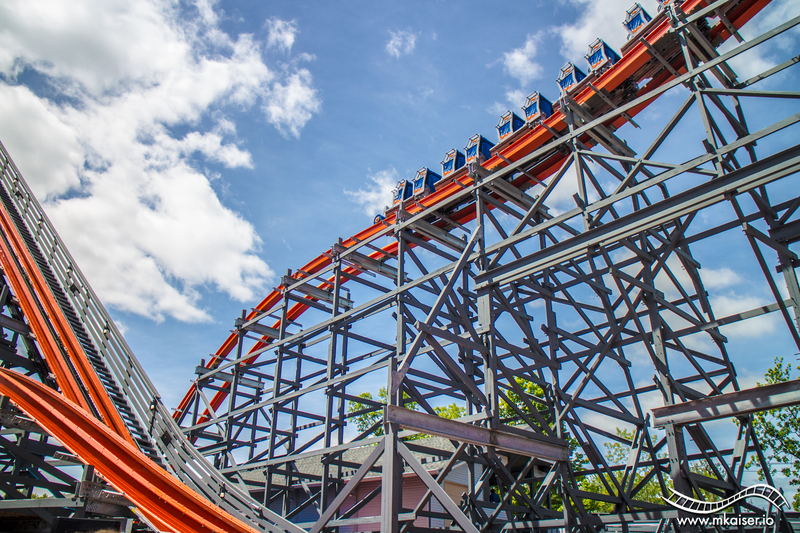 It’s still hard to believe that Six Flags New England is now home to my top two steel roller coasters, Wicked Cyclone and Bizarro. Thanks for reading our Wicked Cyclone review! Be sure to like us on Facebook, follow us on Twitter and follow us on Instagram. See you soon!